PALM SPRINGS, Calif. – The misters at Palm Springs Stadium could not cool off the red-hot Oregon LumberJacks on Tuesday, as they defeated the Coachella Valley Snowbirds, 10-5 for their fourth straight win. Jacks’ (6-3-1) right-handed starter, Kane McCall (1-0), earned the win after not allowing an earned run in four innings pitched. He was backed by his offense that clubbed three total home runs in the contest, including back-to-back shots in the third inning. Oregon sent 10 men to the plate and scored four runs in the third thanks in large part to a two-run home run by Christopher Johnson. Jacob Wark then followed with a solo home run of his own just three pitches later. The Snowbirds (0-10) would make it interesting in the top of the fourth. On the heels of four errors by the Jacks’ defense, Coachella Valley took a 5-4 lead after scoring five unearned runs in the frame. That would be all for the Snowbirds offensively, as Sam Burton, Richard Mariano Jr. and Mike Castellani combined to allow just one hit in three shutout innings of relief. Oregon would benefit from a three run fourth and a three run sixth to ultimately put the Snowbirds away for good. In the fourth, Connor Arcobasso and Chris Bachman singled, and were driven in by an Andrew Skelton three-run homer. 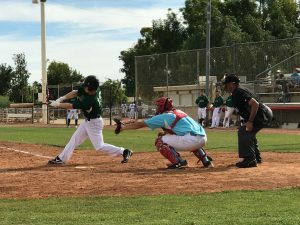 In the sixth, after Jordan Hill reached and eventually scored on a wild pitch, Aaron Endres notched a two-RBI single to cap the scoring for the LumberJacks. 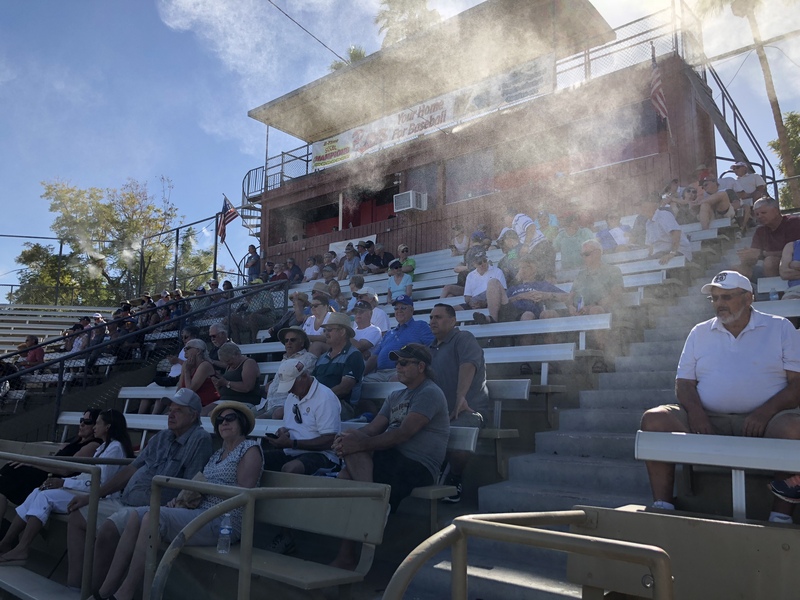 The Alberta Grizzly defeated the British Columbia Bombers, 5-4, in the second game of the day at Palm Springs Stadium. The Grizzly (5-4-1) opened the scoring in the first inning when Matt Jeffery hit an RBI single to center field scoring Brett Thompson, who doubled to lead off the game. The Bombers (2-6-2) followed that up with two runs in the bottom of the second to take the lead on Ryan Smith’s two-RBI single to right field. The Bombers added another run in the third to go up 3-1 when Dax Defelice hit an RBI single to center field. Holding a 3-2 lead in the top of the seventh inning, Bombers reliever Ryan Binggeli allowed three runs, and the Grizzly took a 5-3 lead going into the bottom of the seventh. Jacob Yamane tied it with an RBI single, then Carl Witkowski gave Alberta the lead on an RBI double, and finally, Chuck Terron helped add an insurance run with an RBI single. The Bombers got one run back in the seventh, but came up short as Grizzly reliever Adam Cornwell finished them off. Cornwell got the win while Binggeli suffered a blown save and the loss. In the loss, Bombers starter Jaramy Jacobs pitched four innings and had seven strikeouts, while Grizzly starter Austin Bueter went five innings and struck out eight batters. In a well-pitched game on the auxiliary field, the Manitoba North Stars (6-3-1) defeated the Canada A’s (6-4), 4-1. Gary Aho (2-0) got the win after allowing one run on three hits with three walks and three strikeouts in five innings pitched. Clayton Dostal (2-2) took the loss after allowing four runs (three earned) in four innings. Manitoba took advantage of home runs from Adrian Guzman and Cosimo Canella to ultimately propel them to victory. Home runs from Richard Weston and Jacob Barbee allowed Palm Springs Chill (4-5-1) starter Donnie Speranza to pitch with a lead and eventually defeat the Washington Blue Sox (7-3), 4-1. Speranza (2-2) did not allow a run on eight hits in 5.1 innings pitched. Arik Ward earned the save after giving up a run in 1.2 innings of work. KC Huth went 3-for-3 with a walk, while Luciano Villanueva recorded an RBI single in the loss for Washington. Wednesday, February 7 is “$1 Admission Day” at Palm Springs Stadium presented by Jack in the Box. Fans will be admitted to the stadium for just $1. The first game of the day will feature the Washington Blue Sox taking on the Manitoba North Stars at 10:00am. The Coachella Valley Snowbirds and Toronto Rush will square off at 12:30pm for game two. Those not in attendance may listen to the broadcast live on CaliforniaWinterLeague.com.